Hello! This past Sunday, Missi, my younger sister, celebrated her 19th birthday. We grabbed brunch in the morning with our parents and after, Missi and I headed to Carytown for the afternoon to shop. Before grabbing brunch, we shot a few photos of our outfits. 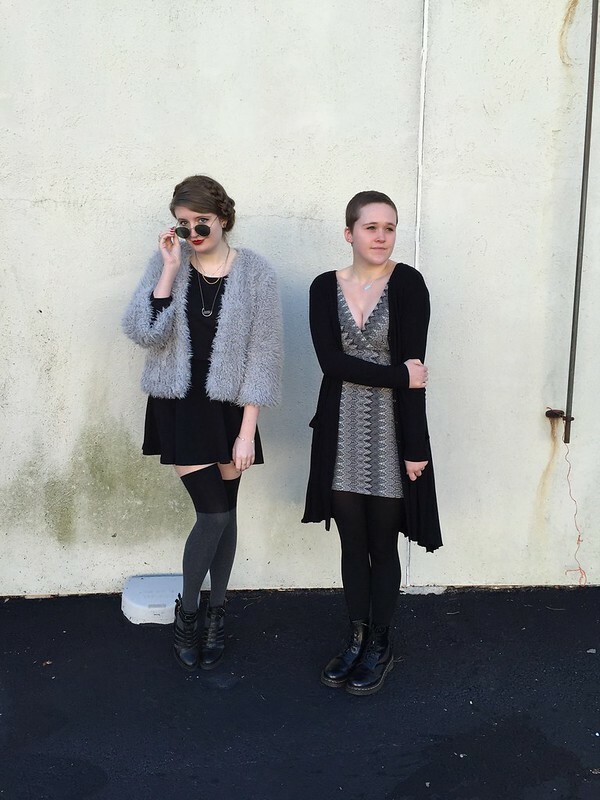 I helped my sister style her outfit and let her borrow a couple pieces from my wardrobe. She borrowed a gray zigzag print dress; the boho print, versatile colors and flattering neckline of this dress make it irresistible. I also let her borrow a long, black duster cardigan to layer over the dress. She cozied the look up with a pair of tights and combat boots. For my look, I also stuck to a simple dark color scheme. I styled a black, long-sleeve top with a black circle skirt. 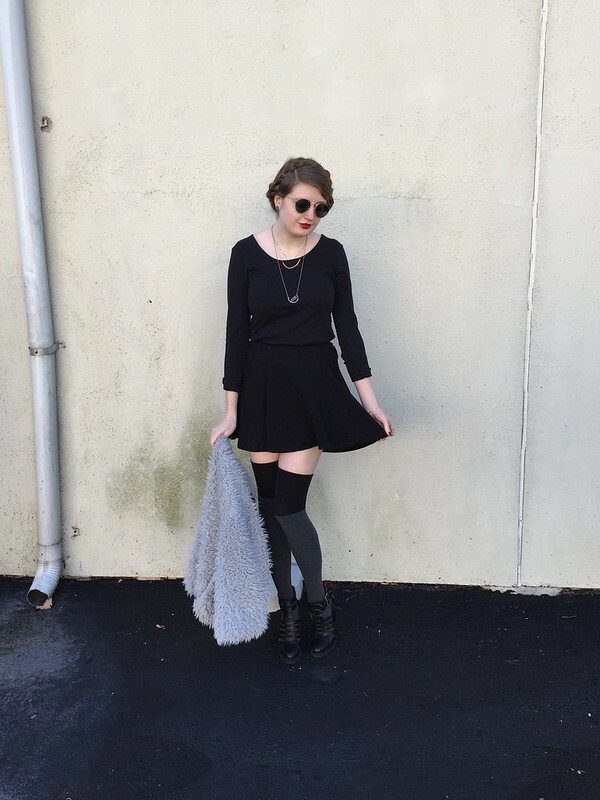 I slipped on a pair of color-blocked thigh-high socks and heeled booties. To keep the look from being boring, I threw on a fabulous, blue-gray faux fur jacket. Talk about a statement-making jacket! My braided hairstyle also made quite the statement. I'm still on my "no using heat on my hair" kick and when I woke up this past Sunday, my hair was too much of a mess so I decided to throw it up into this cute hairstyle instead of using heat on it. I also added a swipe of deep lipstick to add a tiny bit of color to the look. 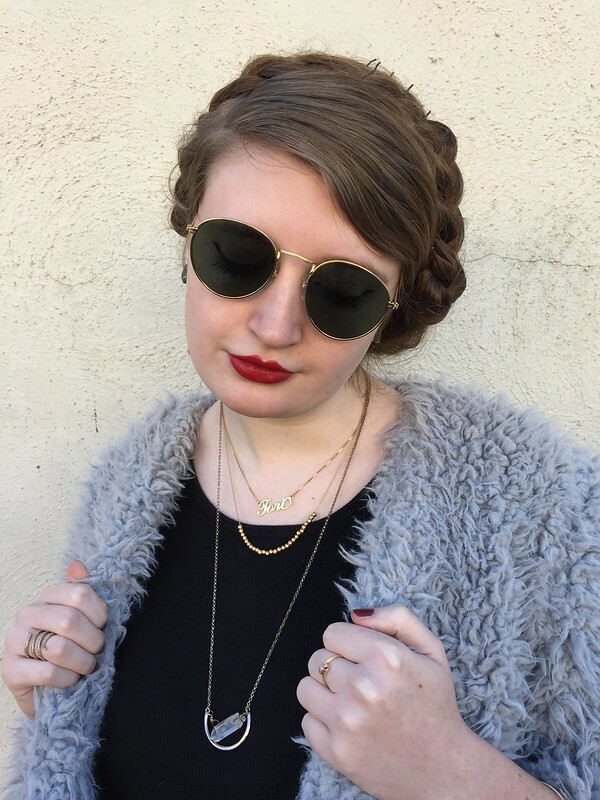 I accessorized with a golden pair of sunglasses and several pieces of golden jewelry including a personalized necklace. Personal Necklace recently sent me this golden, personalized "Tori" necklace to showcase on my blog. This is the 24K Gold Plated Carrie Necklace and it's currently on sale for $25.95. The second that I slipped this necklace on, I fell in love. I've only had this necklace for a few days but have worn it practically every day since receiving it. It's very versatile and very pretty. It's also the perfect layering piece! I can't wait to see all the different ways I can style this necklace. Overall, I'm very pleased with this necklace from Personal Necklace. If you're in need of a jewelry update, I would recommend browsing Personal Necklace and selecting one of their personalized necklaces to spice up your wardrobe. And keep an eye on my blog because sometime within the next week, Personal Necklace will be hosting a giveaway on Fashion, Trends & More for a necklace in the same style as mine! Nice necklace! I love it! It suits you well!